A violent crash in Duncanville sent two people the hospital and left car parts scattered across Danieldale Road. One woman is dead and another is in the hospital after a violent crash in Duncanville left car parts scattered in the street Saturday night. It happened at the intersection of Danieldale Road and Greentree Lane at around 8:30 p.m.
A four-door car traveling westbound was making a left turn when police say a two-door car traveling eastbound slammed into it. 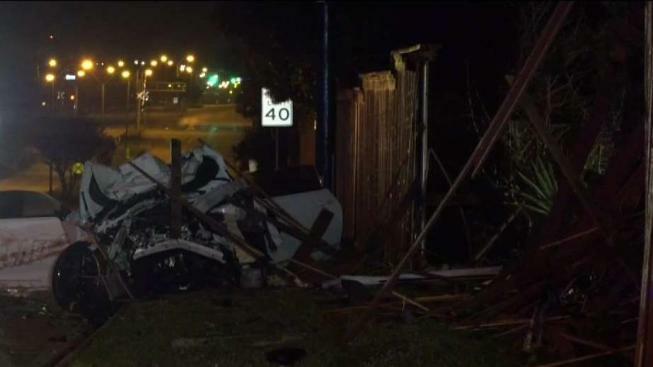 The impact sent one car crashing through several feet of a nearby fence. The driver of the four-door car was taken to Parkland Hospital by helicopter, where she later died from her injuries. The driver of the two-door car was checked out at the scene, the passenger was taken to Methodist Dallas Medical Center by ambulance.